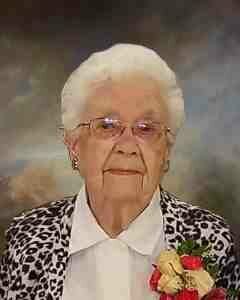 Lorenda Turner, age 100, of Winthrop passed away Wednesday, March 20, 2019, at the New Ulm Medical Center in New Ulm. Memorial Service will be Saturday, March 30, 2019, 1:00 P.M. at Peace Lutheran Church in Winthrop, with interment in First Lutheran Cemetery in Lafayette. Gathering of Family and Friends will be one hour prior to the service. Lorenda Geneva Turner was born on April 28, 1918, in Lafayette, Minnesota. She was the daughter of Alex and Anna (Torgeson) Sandquist. Lorenda was baptized as an infant and was later confirmed in her faith as a youth, both at First Lutheran Church in Lafayette. She received her education in New Ulm, Minnesota, and was a graduate of the New Ulm High School Class of 1936. Lorenda furthered her education at Cedar Rapids Business College in Cedar Rapids, Iowa. On November 26, 1942, Lorenda was united in marriage to James Turner in Lafayette, Minnesota. After their marriage, the couple made their home in Cedar Rapids, Iowa. In 1968, they moved to Redwood City, California, and in 1983, they retired to Winthrop. Lorenda was employed as a bookkeeper for various companies. Lorenda and James shared 65 years of marriage before James passed away on February 4, 2008. Lorenda was a member of Peace Lutheran Church in Winthrop. Lorenda enjoyed traveling, sewing, crocheting and gardening. She cherished the time she spent with her family and friends. Lorenda passed away Wednesday, March 20, 2019, at the New Ulm Medical Center in New Ulm at the age of 100 years. Blessed be her memory. Lorenda was preceded in death by her Parents, Alex and Anna Sandquist; Husband, James Turner; Sister, Helen (Lawrence) Swenson; Brothers, Donald Sandquist, Elmer Sandquist and Reynold Sandquist; Brothers-In-Law, Richard Kellogg and William Turner.